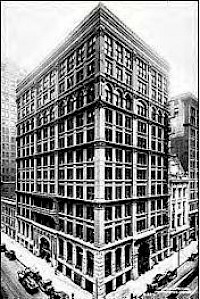 The Home Insurance Building was built in 1885 in Chicago, Illinois, USA and destroyed in 1931 to make way for the Field Building (now the LaSalle National Bank Building). It was the first building to use structural steel in its frame, but the majority of its structure was composed of cast and wrought iron. 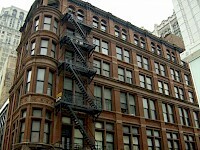 It is generally noted as the first tall building to be supported, both inside and outside, by a fireproof metal frame. The Washington Monument is an obelisk near the west end of the National Mall in Washington, D.C., built to commemorate the first U.S. president, General George Washington. The monument, made of marble, granite, and sandstone, is both the world's tallest stone structure and the world's tallest obelisk, standing 555 feet 5⅛ inches (169.294 m). There are taller monumental columns, but they are neither all stone nor true obelisks. It is also the tallest structure in Washington D.C.. The Auditorium Building in Chicago, Illinois, is one of the best-known designs of Dankmar Adler and Louis Sullivan. Completed in 1889, the building is located on South Michigan Avenue, at the northwest corner of Michigan Avenue and Congress Parkway. It was declared a National Historic Landmark in 1975. It was designated a Chicago Landmark on September 15, 1976. In addition, it is a historic district contributing property for the Chicago Landmark Historic Michigan Boulevard District. 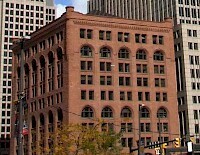 The Hammond Building was Detroit's first skyscraper. 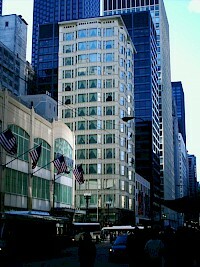 It has since been demolished, to be replaced by the Bank One Building (Now named the Chase Tower). The location of the former building is at the corner of Griswold Street and West Fort Street, in downtown. The high-rise building was constructed in 1889, and destroyed in 1956 to make way for the National Bank of Detroit Building. Fifth Third Center is a skyscraper located in downtown Cleveland, Ohio. 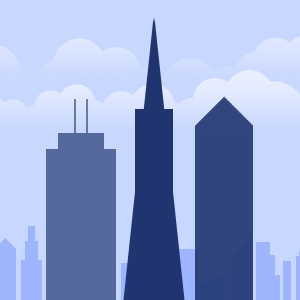 The building has 28 stories and rises to a height of 446 ft (136 m) with 515,000 square feet. It is currently the sixth tallest building in Cleveland. It was designed by RTKL Associates and was originally constructed as Bank One Center in 1992. It was renamed in 2003, when Fifth Third Bank of Cincinnati relocated to the structure. The site of the Fifth Third Center was occupied by the Hollenden House from 1890-1989. 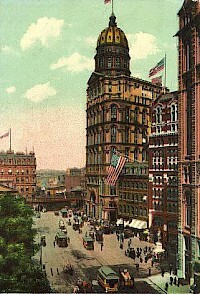 The New York World Building was a skyscraper in New York City designed by early skyscraper specialist George Browne Post and built in 1890 to house the now-defunct newspaper, The New York World. It was razed in 1955. Construction of the New York World Building began on October 10, 1889, at 53-63 Park Row, on the corner of Park Row and the now-closed Frankfort Street. The building was completed on December 10, 1890.